Three railfans go on a 'Sea Cruise'! What would one expect when three seasoned railfans come together? Obviously, some railfanning! But RailKeralites are daringly different! After attending a co-railfan's wedding engagement (on Sunday, November 07, 2010), the three of us (Jimmy Jose, Jaysankar and yours truly) headed out for some bus fanning (Yes! You read it right!). Jayasankar had a plan of traveling on the 'Sagara Rani' cruise for sunset. The rest of us decided to join him on the ride. We headed straight to the KSINC Jetty near High Court of Kerala for reservations - the cruise vessel was docked at the Jetty, and the Cruise manager came out and explained the salient features of the vessel. The vessel looked impressive, and we decided to make the journey despite all odds. The operator, Kerala State Inland Navigation Corporation (KSINC, a Kerala Government undertaking) does not issue tickets in advance. All they do is note down the name of the 'group leader' and the phone number. Tickets are issued only 30-45 minutes prior to the journey, unless the group is big and an advance reservation amount is paid. On the day of our journey, there were all of 19 passengers listed (and the three of us) for the evening cruise. The cruise manager informed that the cruise would be made if there were at least 25 passengers. He asked us to contact him around 1645 to confirm. Jimmy went off to attend some of his official commitments (despite being a Sunday). Yours truly and Jayasankar roamed around the Marine Drive walkway enjoying the breeze and a commanding view of the Shipping channel. Both of us were busy snapping. Later, we paid a visit to the famed Venduruthy bridge (the longest railway bridge in India), and roamed around the surrounding area for a while. We then headed to the Subhash Chandra Bose park along Marine Drive for some more photography. By around 4, Jimmy joined us. We headed back to the KSINC Jetty to confirm if the trip was still on. But the cruise manager remained non-committed. We headed out to a nearby food joint for some snacks, and then returned to the KSINC Jetty. By now, most news channels were flashing warning about the Cyclonic situation along the Eastern coast of India, and it was pretty cloudy. By 1650, he confirmed that the trip was not happening, since there were just 7 passengers willing to travel! He informed that there was a group booking for the next day, and confirmed that the trip is guaranteed the next evening. 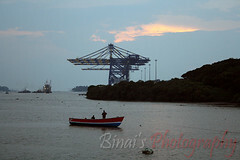 We headed out to Fort Kochi for some roaming around. We met together the next evening for the cruise. Unlike the previous day, this day was not cloudy - it was sunny, and we had a good chance of seeing the sun set. We quickly landed up at the KSINC Jetty, and purchased our tickets. The rate is Rs. 250 per head, and the cruise sets out at 5.30pm (1730) and returns back by 1930 (7.30pm). Jimmy was yet to reach. Jaysankar and myself headed inside the boat to have a look of what was in offer. The boat is two-decked - the lower deck has an airconditioned conference hall (which can seat 50 passengers), and a non-airconditioned restaurant. The upper deck can seat 90 passengers. We checked out all the facilities, and later took a good "window" seat on the upper deck. Jimmy joined us around 5pm. The cruise set out exactly at 5.30pm, and all the 90 seats were taken. The cruise manager - Shri Gafoor - was the guide as well. 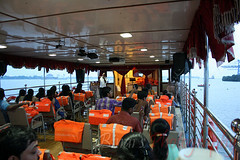 He announced all the important landmarks as the boat cruised through Kochi's waters. 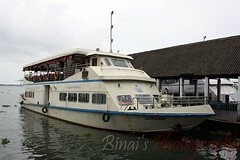 The boat is powered by two Ashok Leyland Marine engines. A while into the cruise, snacks were served - the platter had a veg puff, a cookie and a slice of tea-cake. A cup of Tea was served later. Following the illustrated tour through Kochi's lake, we slowly headed towards the sea. The ride got choppier as we entered the sea. The vessel rocked pretty hard as we traveled more and more into the sea. According to the crew, we traveled close to 6 miles into the sea from the shore (not sure of the veracity of the claim). By now, entertainment program started in the boat. It started off with a few live music performances, followed by a couple of dance programs, and then some songs from the passengers. In the meantime, myself and Jimmy visited the control room (the 'driver's' cabin). He had matured from a regular boat driver to this position. He was very friendly, and spoke a lot about their operations. By now, we were on our way back to the shore. The lights were getting bigger as we neared the city. We later checked out the lower deck facilities - the conference hall was cold, with the AC running at full force. We pulled back to the jetty exactly at 7.30pm. It was one mind-blowing experience, one that I would recommend to anyone coming to Kochi. It was my first experience riding to the sea. Our ride was cushioned perhaps due to the weight of the vessel - had it been a regular fishing vessel, all of our would've thrown up. it was surely "paisa vasool" for the Rs. 250 we paid. See pics from the trip here. 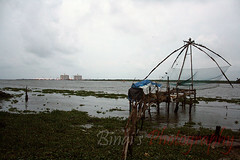 This link has pictures from the two days we spent along the Kochi Shore.